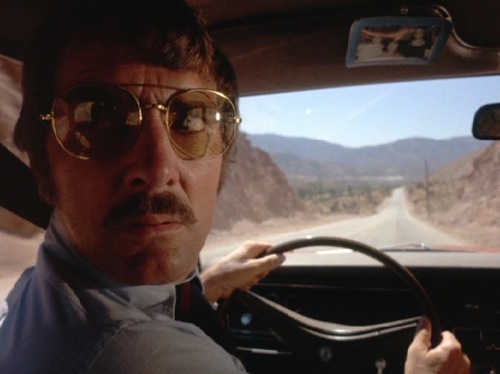 Dennis Weaver, best known for his roles in the television series Gunsmoke and McCloud, and for his driver-in-distress in Steven Spielberg's made-for-TV thriller Duel, died of cancer on Feb. 24 at his home in the southwestern Colorado town of Ridgway. He was 81. Born in Joplin, Mo., on June 4, 1924, Weaver studied at New York's Actors Studio. He made his Broadway debut in Out West of 8th, directed by Burgess Meredith, and later played opposite Shelley Winters in a stage production of Tennessee Williams' A Streetcar Named Desire. He also toured with Shirley Booth and Sidney Blackmer in William Inge's Come Back Little Sheba. Also on TV, Weaver starred in what is considered one of the best television films ever made, Duel (above). Directed by a very young Steven Spielberg in 1971, Duel follows a driver through the American West as he attempts to evade a mysterious truck driver who, for no apparent reason, is out to get him. Weaver's big-screen career, on the other hand, was hardly memorable. He played minor and largely forgettable roles in dozens of films, including Ten Wanted Men, Seven Angry Men, and Dragnet. His best-remembered feature film performance is probably that of a demented motel night-watchman in Orson Welles' 1958 crime thriller Touch of Evil. Off-screen, Weaver worked for the protection of the environment and served as president of Love Is Feeding Everyone (LIFE), an organization that fed 150,000 needy people a week in Los Angeles County. Additionally, he acted as president of the Screen Actors Guild from 1973 to 1975.